Over-the-top Nerf battles are a fun and (mostly) painless way to determine who in the office has to buy the donuts this week. What’s not so fun is having to hunt down every last missing dart afterwards. 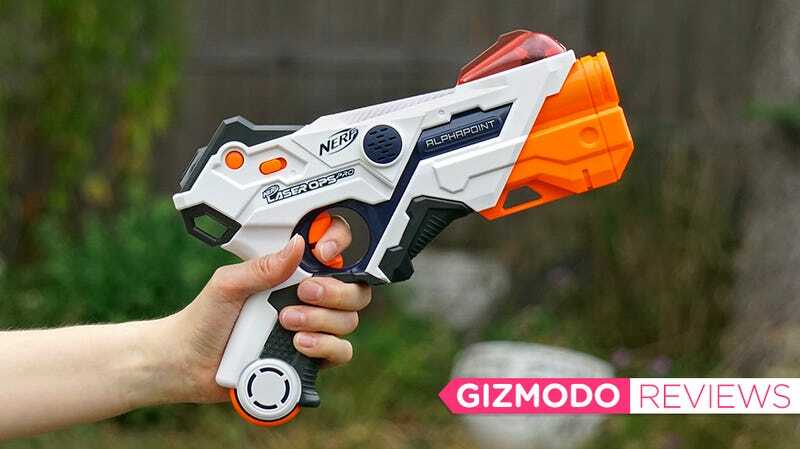 Hasbro’s eliminated that hassle with its new Laser Ops Pro blasters; an updated version of laser tag that might feel like blasphemy to the Nerf name, but actually ends up being more fun than fighting with foam darts. You don't have to clean up foam darts after a battle. 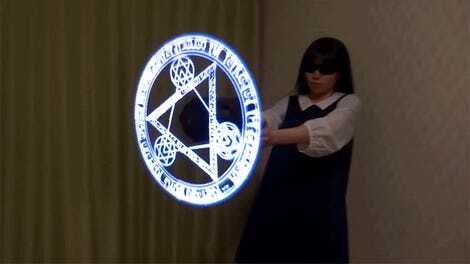 Sound effects are loud, and can't be turned off. 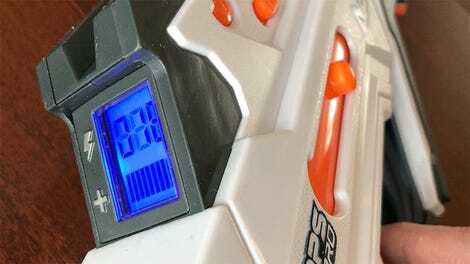 Longtime fans of Nerf might recall that Hasbro released a similar laser tag-like product 10 years ago with its Nerf Lazer Tag Phoenix LTX line. Its all-in-one blaster eliminated the need for annoying vests and other body-worn shot detectors, but for whatever reason, it was quickly discontinued. A decade later, Hasbro is re-introducing its laser tag toys, and while taking out an opponent with an invisible blast of infrared light may never be quite as satisfying as pinging an annoying co-worker with a physical dart, I have to admit that battles with the new Alphapoint and Deltaburst blasters were just simply more fun. The accuracy and hit detection is better, there are some nice (albeit loud) sound effects, and when you connect the blasters to a free accompanying mobile app, there’s stat and performance tracking that leaves little doubt as to who’s earned bragging rights in a battle. 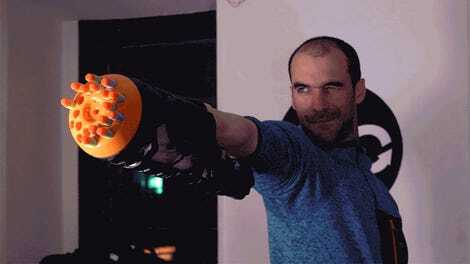 When shooting at stacks of paper cups, or trying to blast your action figures, Nerf’s dart-firing blasters are still the way to go. But when battling friends, I actually think the Laser Ops Pro toys are the better choice. You don’t have to worry about accidentally shooting someone in the face in the heat of battle, or a dart ending up somewhere it shouldn’t. Battles feel less inhibited, and you don’t need to drape yourself in piles of extra ammo to remain competitive. The gameplay options are basic, but they’re really all you need for a quick pick-up-and-play skirmish. 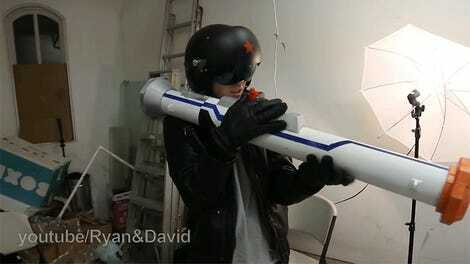 The Nerf Deltaburst looks intimidating, but bigger doesn’t always mean better. The new Laser Ops Pro line currently features two blaster designs: the compact Alphapoint pistol (pictured at the top of this review) and the larger Deltaburst rifle. The rifle offers a few advantages over the pistol in battle, but bigger doesn’t always mean better. Both blasters feature IR emitters and detectors inside a protective dome on top. Both blasters use the same technology to shoot at an opponent, and detect a hit. A clear dome sitting atop each weapon, protects an IR emitter and detector. By keeping them side-by-side, Nerf has made it difficult for players to cheat by putting their hands over the IR detector to block shots. They’d be covering up the IR emitter too, making it impossible for the player to score hits. The Deltaburst rifle features a larger speaker than the Alphapoint, which actually isn’t a good thing. 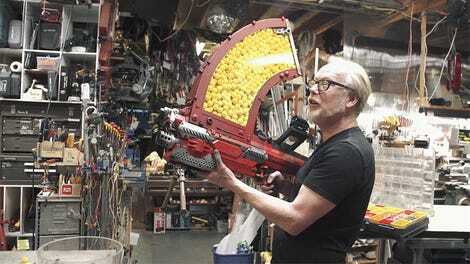 Both blasters are quickly reloaded using over-sized buttons on the bottom. Red, blue, or purple lights on top indicate your team, and which players you can hit. Both blasters use the same buttons and setup procedure when it’s time to go to war. Players first use a switch to select indoor or outdoor play, which compensates for all the extra infrared light when you’re out in the sun. After powering up the blasters, the ammo reload button on the bottom of each weapon is used to select teams, which is indicated by a glowing light on top. You can opt for a blue team vs. red team battle, which ensures players can’t accidentally snipe a teammate. Or there’s a purple free-for-all mode that’s every player for themselves. The Deltaburst rifle (left) uses an actual LCD screen for ammo and health levels, while the Alphapoint (right) uses color-changing icons. So how do both blasters differ? Each one features a small display indicating how much health and ammo a player has remaining. (You can reload as often and as many times as you want in battle.) But while the Alphapoint pistol uses two simple glowing icons that go from green to red to indicate when health (12 shots) and ammo are getting low, the Deltaburst uses an actual LCD display that counts down your 18 available shots, and a series of diminishing bars to indicate your health. The animated force-feedback features on the Deltaburst are fun, but quickly get tiring, even a little annoying, and can’t be turned off. The Deltaburst rifle seems like the better choice when going into battle, but there are a few reasons why I much prefer the smaller Alphapoint instead. Pulling the trigger on the Deltaburst not only fires three shots each time, it also triggers a force feedback mechanism to simulate kickback, and to create the animated reload effect of a bolt-action rifle. It’s fun, but the mechanism is very, very loud. Loud to the point of quickly becoming very, very annoying when paired with the Deltaburst’s ‘pew-pew’ sound effects which also can’t be turned off, or turned down. You can connect a smartphone running the Laser Ops Pro app to either blaster to enhance gameplay. The Laser Ops Pro app keeps tabs on hits you make, hits you take, and your accuracy. At the end of a round the app doles out awards based on players’ performances. The single-player augmented reality mode unfortunately isn’t terribly exciting. The stretchy smartphone mount holds your device securely, but depending on the smartphone, the straps can block the camera needed for the single-player AR mode. If you want to get more involved, however, you can always connect the Alphapoint and Deltaburst blasters to a free Android/iOS Laser Opps Pro app (unlike other laser tag games the phone is optional). It tracks stats, letting each player see metrics on their performance and accuracy at the end of a fight, proving who was the superior gunslinger. It can also provide a sort of opponent-tracking radar when everyone in a battle has GPS turned on, and when you attach your smartphone to the front of either weapon, there’s even a single-player augmented reality mode where you can shoot at enemy spaceships that appear over a live feed from your phone’s camera. I’m as surprised as anyone that after just an afternoon of playing with Nerf’s new Laser Opps Pro toys, I don’t miss the darts. You don’t have to worry about a mis-aimed projectile accidentally knocking over a priceless Ming vase, and after an intense battle there’s nothing to clean up, and nothing to reload. I feel it’s important to point out that neither of these blasters are quiet toys, however, which could be problematic for office play, or already frazzled parents. But the smaller Alphapoint is a little softer on the ears, and available in a discounted two-pack for $45, making you instantly ready for a duel. I’d skip the larger Deltaburst too, and instead use that $50 to double your laser arsenal, allowing two more friends to join the fun. You never have to reload darts, clean up darts, or worry about darts hitting something they shouldn’t. 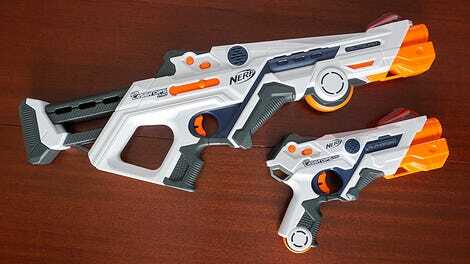 At $30 for the Alphapoint and $50 for the Deltaburst, these aren’t the cheapest blasters in Nerf’s current lineup. Both blasters have loud sound effects that can’t be muted, but the added force feedback features in the Deltaburst rifle are even louder, and quickly get a little grating. Accuracy and distance are impressive, but don’t expect to be battling friends across a football field. The optional connected app ensures there’s never any controversy over who won a battle.